Synthetic hair wigs can be difficult to dye. This is a guide about dyeing a synthetic wig. 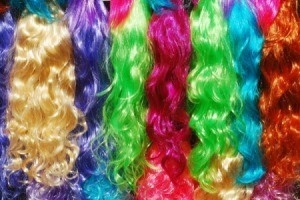 Question: How Can I Dye Synthetic Wigs? This is to hairdressers or anybody who knows: Can wigs with synthetic hair be dyed (successfully) with regular hair dye? I have some secondhand wigs that are the wrong color for me. Thank you. I like the spray on colors because if done carefully, they can take away the artificial shininess of an acrylic wig.